Zello I want to thank you sincerely for all your hard work selling my home and finding us a new one. You were amazing! As you know, it was very emotional for me at times - to sell my home where I raised my family over the past 21 years - and you helped me through those ups and downs sensitively, with support and patience. You were a good friend on top of a good real estate agent. Of course helping us buy a beautiful new home certainly helped! I have contacted you on and off for about 15 years contemplating the "big move". I really appreciated that you never pressured me to sell - despite all your work at those times. I also appreciate your efforts to sort through the many mixed messages as to what we wanted in a new home, and help us sort through our own confusion on this very important matter. Refreshingly, you were not there "just to make a deal". Rather you were there to make sure we got what we wanted at the price we were prepared to pay and your advice was invaluable throughout the process. Thank you Zello. I had the pleasure of working with Zello for the sale of my home. After interviewing several agents, Zello was the clear choice based on his services offered, his passion and knowledge for real estate, particularly in the West end of Toronto. My expectations were consistently exceeded thanks to his extreme organization, hands-on approach and belief in “constant contact” via text/email. Following a clear explanation of the process, he presented me with a clear marketing plan and calender of events. He provided me with packing supplies, helped me move boxes and items to storage, dropped off undesired items at a donation centre. He ensured my home was looking pristine for showings by providing handyman, painting, house cleaning, window cleaning and staging services. The resulting professional photos and marketing brochures were exemplary. Additionally, during this emotional time, Zello functioned as my pseudo-therapist, listening attentively and helping me through my exciting but difficult transition. The subsequent negotiation process was time-efficient and ran smoothly as a result of him spending many hours prior to receiving offers to prep and prepare the other agents for the “main event”. His professional, gentle but firm and persuasive nature secured me a greater than expected price for my home for which I am thrilled! I highly recommend Zello Jovanovic as a real estate agent to anyone looking for a stress-free sale with maximal profit. Zello was recommended to us. That is the best advertising. We will now readily recommend Zello. Selling a house is rarely simple, but we never expected all the surprises and challenges that accompanied our recent sale. Zello was supportive, calm and professional. He always had a plan, a solution based on integrity and experience. His take charge attitude was always respectful and sensitive. His well chosen team exemplified the same characteristics. All were a pleasure to work with. As a result, the final outcome of the sale was well beyond expectations. Dear Zello, Just a quick note to let you know how very pleased Lorenzo and I were with the selling of our house and the purchase of our new one. We've settled in and the new house really suits us .... we love it. You made the entire process a pleasurable one. We really appreciated your patience, knowledge and terrific advice along the way. Kate and your team were amazing to work with as well. Thanks again for making what could have been a very stressful situation actually fun. Many thanks again! C. R. & T. R.
Hi Zello, I thought I would take a moment to thank you and your team for selling my income property. This was not a “cookie cutter” project; you and your team were able to handle all aspects of the sale including, strategy, staging, presentation, and the numerous showings. Your professional manner and clear focus were critical when dealing with prospective buyers and the sometimes “difficult tenants”… Full asking price, 30 day closing, no conditions… a sellers dream… Well done Zello! All the best in the coming year. We were referred to Zello Jovanovic by my brother who had previously purchased a home through him. My brother's exact words were "if you want to sell your home with someone who is patient, listens to your needs, and will find you the home of your dreams, without pressure, you need to go with Zello." My husband and I decided to give Zello a call. From the very beginning his personality, professionalism and knowledge of the market made it an easy decision to buy a house and list our home through him. Throughout the time span of over eight months he showed us homes that met all of our expectations and in the end we bought our new home in the area of our choice. During this process Zello did not pressure us to buy, he allowed us to ask questions, take our time to decide, putting himslef in our shoes and understanding our wants and needs as if he were purchasing the home as well. In listing our home for sale, Zello and his team were extremely empathetic and sensitive to how our home would best show for sale. His team came in and professionally staged, cleaned our carpets, windows, and prepared the home for sale. The selling brochure and pictures were exceptional and by far exceeded our expectations. Zello understood our sentiments of our home that we lived in for over 23 years. He recommended a listing price for our home but did not force us to list for a price we were not comfortable with. Ultimately, our house sold at the proper market value. Zello Jovanovic represented us on the sale of our home. From the beginning he was a consummate professional. His marketing plan was well thought out and realistic. We placed all our trust in Zello and let him run with the listing, and preparation of the home. It was the best decision we could have made. One of Zello’s greatest strengths is his team of professionals who prepared our home for showing. With almost military precision all elements of home preparation were carried out with almost no effort on our part. A handyman carried out necessary repairs while window cleaners, carpet cleaners, a stager, a home cleaner, painters, and a home inspector all did their jobs leaving the home a masterpiece for showings. Throughout the process Zello stayed in close contact and supervised the work. He calmed my fears that such a feat could not be pulled off in such a short time. Of course Zello was right and everything came together wonderfully. Finally Zello guided us through the process of negotiations and ultimately made both buyers and sellers very happy. I can’t express adequately what a joy it was to work with Zello. His easy going personality and knowledge of the market make him a tremendous agent. I will recommend him to all of my friends and colleagues. 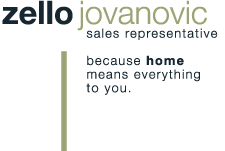 Zello Jovanovic and team have been extremely helpful and successful in our house search and sale. Particularly with regards to the sale, they know how to attract potential buyers with a deep and effective marketing plan and have a core team in place to ready the house in the quickest time possible. We are not easily impressed, so it means something when we say this: Zello is a pro and knows what he is doing. Also he is a very amiable man whose company we enjoyed throughout the search and sale; that is something that can't be taken for granted either. Thank you! Zello Jovanovic represented us with the purchase and sale of three different properties, including our most recent. He has an understanding of today’s unpredictable market conditions and prides himself on offering a complete service to his client’s. 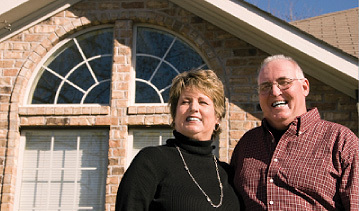 Zello’s past experience in house building, distinguishes him from other realtors. He thoroughly understands both old and new construction. He takes pride in every house he represents and is always enthusiastic and positive. The purchase and sale of our properties were very emotional, but Zello had a knack for putting us at ease and kept us informed at all times. He went above and beyond what friend’s told me their agent had done for them. He is extremely professional, service oriented and patient. We have recommended Zello to many people and would definitely continue to do so. In our opinion, he is the complete package in Real Estate. We are thrilled with our decisions and credit him for his involvement. Dear Zello, Annie and I wanted to send along a note to thank you for your services in managing the often difficult process of selling our home in Lorne Park recently. Given the current turbulent economic times, we were fortunate to have you and your team led the process from start to finish. From meeting with us originally to detail the process, to having Kate handle the compilation of the materials necessary for the first rate Sales brochure, to dealing with the agents in terms of the Agent Open House, the process went very professionally. As you were aware, it was a difficult but in the end correct decision to sell our home, and your sensitivity throughout the process was appreciated. Both Annie and I were especially appreciative in terms of your experience during the actual negotiations with the buyers. Your understanding of the market and the potential motivation of the buyers allowed us to sell at a price that in the end quite frankly exceeded our expectations. Thanks once again Zello for your dedication, professionalism and attention to detail in making this often traumatic process as painless as possible. We have no hesitation in recommending your services to other potential buyers and sellers and have! I want to express our sincere gratitude to Zello Jovanovic for his patience, commitment, and guidance in finding a home to fit our family’s needs. As our agent, Zello took a usually stressful endeavor and made it a painless process. He was always available to address any of our questions or concerns, making us feel like we were his top priority. His vast knowledge of the Toronto real estate market was a great asset in buying and selling our home. Zello is not just our real estate agent, he has become a trusted family friend. Dear Zello, The purpose of this letter is to express my many thanks for your involvement in selling our current home and finding our new home. I have heard from many that selling your home is said to be one of the most stressful times in one's life. As I reflect on our experience with you this fall, our situation could not have been more opposite. When we listed I had no doubt that we would get the best offer possible, and it was achieved because of your knowledge of the market, preparedness in getting our house ready to sell, your tireless work ethic and by spending time with Bruce and I to ensure we understood the process and were making the right decision. have been in sales at Xerox for ten years. When buying and selling this fall I often caught myselft with my sales hat on evaluating the process, the product, the buyers for our current home and what type of bid we had put in place to win our new house. Throughout this, what stood out for me is that in a time when houses in Toronto are in such great demand, you as our agent were not in the deal for a quick win, but actually slowed us down at certain steps of the home buying process to re-validate our priorities so that we would be 100% comfortable with our decision. Your conscience and consideration was much appreciated at a time when emotions can run very high. I am exceptionally excited about moving into our new home and on behalf of the Maxwell family would like to thank you. I would be happy to speak to any of your potential clients down the road about our positive experience. Dear Zello, It is with great pleasure that we write to thank you for your exceptional performance in helping us sell our home at 88 Fairview Ave in Bloor West Village during our relocation to Tokyo with NISSAN. We were amazed that, within one week of our intial meeting about listing the house, you produced an offer to buy at our asking price. Then you successfully negotiated on our behalf to move it higher. This was a stellar job by any measure; however, we were particularly pleased given our tight timeframe for our move overseas. You are clearly no stranger to complexity! We appreciated how you took charge of the entire sales process, bringing in all the right people to prepare the home for sale, getting the message out to the market and calling us with daily updates while we were in Japan. With the home sale being so expertly managed, we were able to focus on other aspects of our relocation. Finally we really enjoyed working with you, and felt we had a true ally in times of need. Our calls were answered almost instantaneously, and there were those great moments when you encouraged us to sit back, breathe, and laugh. Please accept this small gift from Japan as a token of our gratitude. Our friends and family have been demanding to know how we sold our home so fast, and we are happy to share with them our secret: Zello Jovanovic! Thank you again, and keep in touch. Sheryl and I would like to thank you for your assistance in the sale of our existing home and the purchase of our new home. You came well recommended and exceeded our expectations at every step throughout the process. We have had numerous experiences with real estate agents and your professionalism, work ethic and commitment to our interests is unsurpassed! We wish you the best of luck in the future and will continue to recommend your services to our friends and family. Anne and I would like to thank you profusely for assisting us in our search for a home in the Toronto area. We have started to settle in and are enjoying it very much. Please come by when you have a chance to see the changes that have been made. You came to us well recommended and it's easy to see why. You have a combination of: market knowledge, patience, and the willingness to work long and hard hours educating your clients. We were hoping to purchase a home and were primarily looking in only the good residential districts, which meant that we were looking where prices were high. We preferred a bungalow, and in many locations very few of those were available, when they were, they almost seemed to be more expensive than 2-storey homes. We were forced because of the market to consider 2-storey homes and semis as well. When you saw that we were becoming interested in a home you not only outlined the good features but also mentioned the negatives in order to help us consider the home on a more balanced basis. Thanks to you, we ended up with a bungalow in a good location within walking distance of Bloor Street and having many improvements, including a recently constructed garage, and a beautiful garden out back. Your negotiating skills proved to be unbelievable as our transaction, which happened on a Sunday, was started and completed only two hours later. Our daughter witnessed that negotiating session and she and her husband have now become another happy and successful client of yours. WE ARE EXTREMELEY PLEASED WITH YOUR SERVICES! Meni and I couldn`t be happier with the outcome of the sale of our home. Your sales methodology ensured we got the highest price for our home (116% of asking!) and your PROFESSIONALISM, KNOWLEDGE OF THE MARKET, INTEGRITY AND NEGOTIATING STYLE are your strengths. I would recommend you to everyone I know that wants to sell or buy a home. Another key strength you bring to the table is your ATTITUDE. You focused on the positives and minimized the negatives when it came to marketing our home. Even if a bit late, we want to thank you for your excellent work in selling our house and helping us to buy our current home. Your professional yet good-humoured attitude made what might have been a stressful experience an enjoyable one. In everything you did, you went above and beyond our expectations for a realtor. You did a fantastic job at every phase of selling our home. Before the sale you took the time to realize the potential of our house and your suggested improvements helped us to spend our money and efforts wisely. The staging and professional photographs were key factors in the considerable interest that was shown in our home. At close, your combination of expertise and shrewd negotiating skills were what allowed us to sell our home at the highest possible price. In searching for our new home, what we appreciated most was your patience and your objective, honest input. You took the time to understand our needs and never pushed us into making any decisions we would regret. We are delighted with our new home. Your eye for value in a home that goes beyond the obvious for staging and aesthetics is why we trusted your input. Your experience with home renovations is an invaluable asset and your help in finding quality trade people and monitoring their progress far exceeded any of our expectations. We cannot thank you enough, Zello, for all of your help and support and will continue to recommend your services to our friends. I have had dealings with over 2 dozen real estate agents and I can say that my experience with Zello Jovanovic was the best by far, bar none. He goes out of his way to educate you on the current market in your area, and give you a realistic picture of "value" for your properties of interest. He guides you through all aspects of a real estate deal, regardless of buying or selling, from the initial meeting, to "doing the deal", down to the final closing. You will be impressed with Zello. We wanted to thank you again for helping us find the perfect home and for helping us with our renovations. For the past 8 years you have been so patient with us and we have been very happy with your professionalism, great service and how you have helped us find exactly what we were looking for. We thank you again for all your hard work, and we really appreciate everything you've done for us. To our delight, Mr. Jovanovic has and continues to perform far beyond our expectations. An extremely hard working, relentless Realtor, Zello`s integrity and success rate has proven to be second to none. Zello is a dedicated expert, loyal to his clients and associates, knowledgeable and honest due to his many years of experience as a seasoned professional. In so far as being a builder client to Mr. Jovanovic, we are impressed by his extensive knowledge of the residential construction industry and appreciate his diligent attentiveness to our business endeavors as a new home & renovations company. In closing, with great enthusiasm we look forward to working with Mr. Jovanovic and his experienced team of assistants on our new projects slated for years 2006 & 2007. We want to take this opportunity to thank you for your tremendous work in finding us a home. You have a sincere ability to put your client`s best interest to the forefront. Your commitment to patience and thoroughness allowed us to narrow it down and eventually find exactly what we were looking for. Your professionalism, honesty and knowledge of the marketplace were qualities that afforded us a great deal of comfort throughout the entire process. My wife and I engaged Zello Jovanovic as our real estate agent to assist us with selling two houses and purchasing another while we were in the midst of planning our wedding. Zello was very professional and knowledgeable and answered all our questions with candour. Zello has a great attitude and it is a pleasure to deal with his dedication, sense of humour and time commitment. Zello went beyond the call of duty many times in numerous ways and made sure the entire process went smoothly. With regards to the house sales, Zello provided us with information concerning the local markets, including comparable recent sales, and provided us with a detailed marketing strategy. Zello also assisted us to ensure we were able to highlight and present the best characteristics of both houses so that we were able to finalize the sales quickly and for the maximum value possible. Zello was also very useful in helping us to understand the real estate market in our desired new neighbourhood of Bloor West Village. Zello showed us numerous properties and explained the advantages and drawbacks of those properties and their varying locations within Bloor West Village and the surrounding neighbourhoods. Zello was great at negotiating the purchase and ensured that we were able to secure the first house which we desired and bid for, despite a bidding war for the property. Zello, you did it again, you delivered big time! Finding and securing our second home, selling the first house we purchased through you. Great job! Your hard work, positive attitude, and excellent people skills were evident throughout the entire process. Our belief in your knowledge of the market, coupled with our trust in you personally, has resulted in an excellent relationship. If anyone is buying or selling real estate they are best served with you at the table representing their interests. Thanks from the Lama family. C. E. & M. M.
Now that Mark and I have settled into our new home we just wanted to take the time to thank you for all your hard work finding us our dream house. It was a fast paced time but you got us through it with humour and ease. Your professionalism in selling the condo was evident as it sold in a weekend for about 99.9% of the asking price. You took the time with both of us to find out exactly what we were looking for in a house and never doubted that it was out there. What really stood out is that when you saw our current house you knew it was the one and worked hard that day to make sure we would get it. From last minute phone calls for home inspectors, to guiding us through the entire process that night, you made sure the entire process went smoothly. Even with the quick close you came through with the better finance company and once again made everything work. Mark and I would not hesitate to recommend you to any of our friends and family and wish your continued success. Thanks again for all of your hard work. Thank you for a pleasant, professional and financially rewarding experience during the promotion and sale of our duplex. Your attention to detail for the listing, promotion and showing of the property was impeccable. The people-skills and integrity you demonstrated in dealing with our Tenants and the Buyer was outstanding. But best of all your market knowledge and price positioning of our property was on the money; resulting in a better than asking final sale price. I would not hesitate working with you again or recommending you to my friends and business associates. Veronica and I wanted to thank you for all of your efforts in helping us to buy our new home. It was a long road and, over the past three years, we took you in many different directions with regards to pricing, location and layout/style. To your credit, you hung in there with us and helped us make our dream a reality. Throughout the process we came to rely on your positive attitude and in depth knowledge of the marketplace along with your patience and understanding of what we were looking for (not to mention your consensus-building skills!!!) You really took the time to listen and then worked relentlessly and with the highest level of integrity to source out and successfully negotiate our purchase. We knew we could trust that you had our best interests at heart. You are a true professional and we would be pleased to recommend you to anyone looking for a real estate agent. M. M. & J. DR.
Joey and I would like to thank you very much for your outstanding service. Buying and selling a home can be very stressful, but with you as our Agent, we felt that we had a trusted friend to help us through the experience. We have finally settled into our new home and we are extremely happy; we love our street, we love our neighbourhood and we feel that we got very good value for our money. We will definitely refer you to any friend or colleague who is looking for a real estate agent. Again, thanks for the superb service. Shannon and I wanted to extend a huge thanks for hanging in there with us. Three years and about 10 trips to Newmarket from Bloor West and we finally found our gem! We also wanted to thank you for the great job you did selling our place. It was a stressful time and you always seemed to make everything tolerable. That`s two successful sales in less than 5 years! Christa and I would like to thank you for all your hard work in facilitating the purchase of our new house and the sale of our old one. Your professionalism and dedication has made this experience as easy and enjoyable as possible. We are very excited with this change and want to thank you for your contribution. We will not hesitate to recommend you to anyone seeking a real estate agent! 270 The Kingsway, Suite 200.